The global reprocessed medical devices market features a number of dominant players thanks to the lucrative opportunities present in it. Leading manufacturers and distributors of reprocessed medical devices include Hygia Health Services Inc., Centurion Medical Products Corporation, Ethicon Inc., SureTek Medical, Medline ReNewal, ReNu Medical Inc., Stryker Sustainability Solutions Inc., Vanguard AG, and MidWest Reprocessing Center. According to Transparency Market Research (TMR), the global reprocessed medical devices market is expected to exhibit a strong 14.9% CAGR between 2016 and 2024. The market was valued at less than US$1 bn in 2015, but is likely to rise to a valuation of US$3.35 bn by 2024. 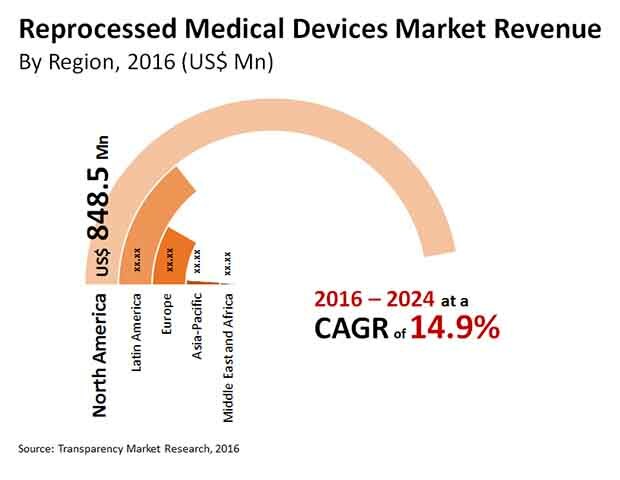 The reprocessed medical devices market is segmented by device type into general surgery medical devices, gastroenterology biopsy forceps, cardiovascular medical devices, laparoscopic medical devices, and orthopedic external fixation devices. Of these, cardiovascular medical devices are likely to retain a dominant share in the global reprocessed medical devices market in the coming years. The consistent need for cardiovascular medical devices in hospitals across the pricing spectrum is likely to ensure steady dominance of the segment in the global reprocessed medical devices market. Cardiovascular medical devices accounted for more than 60% of the global reprocessed medical devices market in 2016 and are likely to remain similarly dominant through the forecast period. Geographically, the global reprocessed medical devices market is dominated by North America, which accounted for more than 75% of the global market in 2016. The steady technological advancement of medical devices in the region is the prime driver for the North America reprocessed medical devices market. The rapid conveyor belt of technological upgrades has led to a conducive environment for the reprocessed medical devices industry, which has found a steady consumer base in developed countries such as the U.S. Europe is also likely to contribute significantly to the global reprocessed medical devices market in the coming years, as the economic rise of countries in the region has led to steady investment in the medical devices sector, leading to consistent demand from the reprocessed medical devices market. The prime driver for the global reprocessed medical devices market is its benefits in terms of extending the bottom line. The high rate of technological progression in the healthcare sector in recent years has led to a situation where even out-of-date devices provide excellent medical care and at lower rates than the latest models. This has led to several hospitals at the lower end of the food chain opting for reprocessed medical devices, enabling them to garner considerable savings. The reprocessed medical devices market is also driven by the rising awareness about the adverse environmental effects of dumping medical devices in landfills. The widespread use of plastics and other artificial polymers in medical devices is likely to magnify the benefit of this factor to the global reprocessed medical devices market, as the use of biodegradable materials in medical devices has still not been widely incorporated.